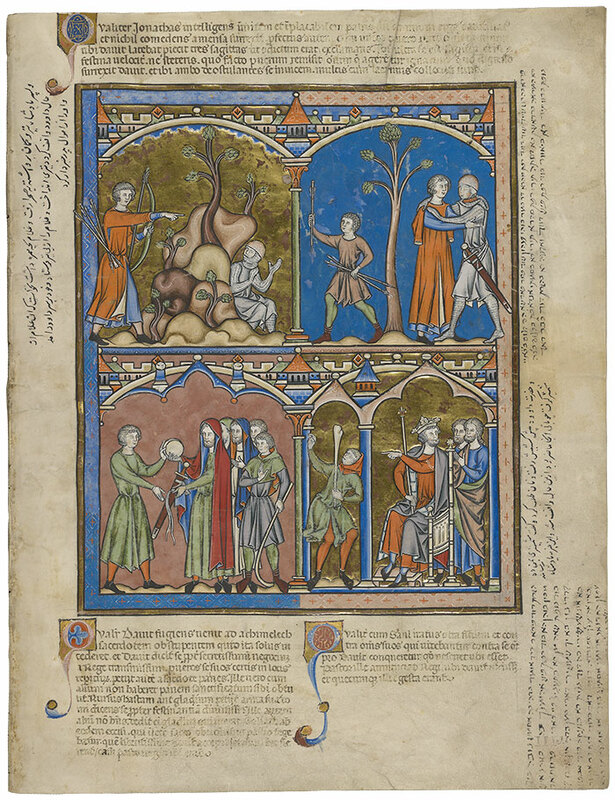 Upper left margin: The king’s son picked up a bow and arrow and went into the fields and he had a page with him. Not wanting the slave to know of David’s whereabouts, he threw an arrow and sent the slave after the arrow and he himself came upon David and informed him of his father’s state. Lower right margin: His Excellence David went before the priest and requested bread and said, "Give me a sword." He got a sword. A shepherd was present there; he found out about this event and delivered the news to the king. Upper right margin: The next day, which was the day of the festival, David went in the field, hid in the midst of the hills. The king’s son also took along a young boy to bring back arrows shot into the field. He shot off an arrow and said to the boy, "Go get the arrow," while he himself went before David and informed him of the incident [with his father].